The second flight of eventers took to the dressage arena at TIEC this morning, trying to better Julia Krajewski of Germany and Chipmunk FRH’s astounding score of 19.9pp posted yesterday. Canada’s third team members, Jessica Phoenix and the international veteran Pavarotti, had a pleasant, steady test marred only by a couple of over-exuberant changes of lead which earned them a score of 33.0pp and 50th spot at the end of the day. Phoenix’s fan entourage including her children, Jacob and Jordan, her husband, Joel, her mom, dad and her sister, as well as Pavarotti’s owner, Don Good, are all on hand in Tryon to cheer her on. 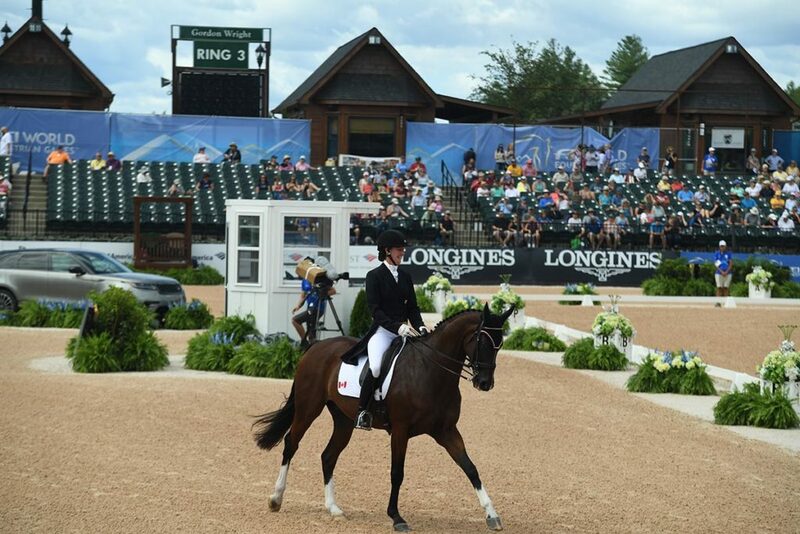 Last up for Canada, Selena O’Hanlon of Kingston, ON, rode what looked to be a lovely test, scoring 30.7pp and finishing in 37th place at the end of this phase. The Canadian Team of O’Hanlon, Phoenix, Colleen Loach/Qorry Blue d’Argouges (60th) and Lisa Marie Fergusson/Honor Me (80th) currently sits in 13th place, while Hawley Bennett-Awad, competing as an individual, is 50th with Jollybo. Germany leads the team standings, followed by Great Britain and the USA.